Choose whether you want the Dovecot POP3 or IMAP or both servers to be turned on. Additionally, you can set custom port numbers but, for the start, leave them at the default values. Click the Start Dovecot button. 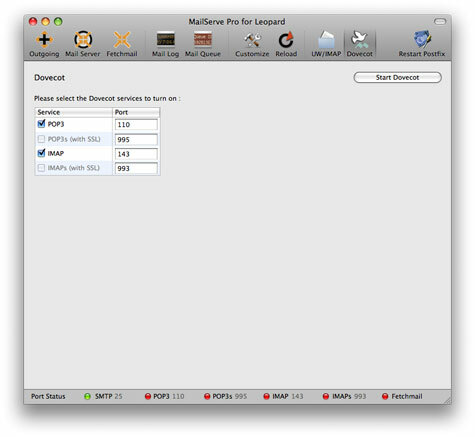 The POP3 and IMAP port status indicator lights will come on if the respective service has been successfully turned on. If you need to change the configuration later on, remember to click on the "Restart Dovecot" button to make it stick.